For John Herendeen, buildings have always been more than mere shelters. Born in 1931 in Chicago, he grew up surrounded by a rich array of innovative architectural structures. His college studies earned him a Bachelor of Architecture degree from the University of Illinois and in 1961 he received his registration as a certified architect. Choosing to return to his native Chicago area, he worked for several major firms over a period of 25 years. Even today, although a full time artist, he will occasionally accept an interesting architectural assignment. 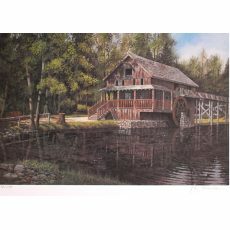 Herendeen began his painting career in 1977 choosing to depict the subjects he knows best - buildings. Yet unlike the shiny, new, modern structures of his architectural renderings, his paintings are of old homes, farms and landmarks of bygone days. He has traveled extensively throughout the United States searching for buildings with a distinctive character of their own, nestled in just the right setting. 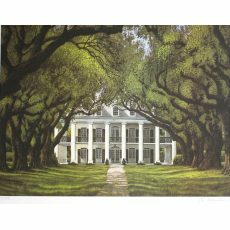 He has been inspired to paint the stately mansions of the old south and the intricate Victorian homes of the Midwest. He sometimes depicts these majestic structures in their original resplendent glory. Yet more often he finds that the elements of time and weather have transformed these magnificent buildings into a mysterious component of their environment. 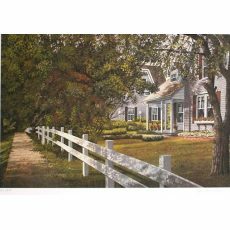 He has often been moved to depict the warm, charming habitats so typical of New England. And in contrast to these historical structures, he also enjoys painting the hauntingly secretive shelters of the old west. In each of his paintings Herendeen captures the character of the scene created by a unique blending of a man made structure with its natural surroundings.